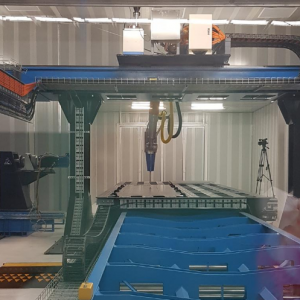 Titomic, an Australian company specialising in leveraging advanced materials and a new additive manufacturing technology, launched the World’s Largest Metal 3D Printer. The company unveiled the metal 3D printer with a live demonstration in front of an invited audience at its mega-warehouse in Melbourne. Titomic, the Commonwealth Scientific and Industrial Research Organisation (CSIRO)-backed company, has built a metal 3D printer capable of printing out aircraft wings, rocket fuselage, submarines & ship hulls. The technology is called as Titomic Kinetic Fusion Technology and developed by CSIRO and exclusively commercialised by Titomic. The powder spray fusion method developed by CSIRO is completely different than any such technology employed across the world. This technology was commercialised by Titomic. Titomic uses the same technology in one of its earlier printer which can manufacture and polish a complete bicycle frame in 35 minutes. The newly launched printer is capable of producing many big parts currently not possible in any commercial printer. Currently, they are printed in smaller parts and then assembled but this new printer eliminates the need for assembly and thereby enhancing the potential of 3D printing even more. Titomic Kinetic Fusion Technology is a cold-spray technology which sprays metal particles through a gas-powered jet at high speeds. The jet is shot at a scaffolding structure onto which the accelerated metal particles fuse and the structure is built layer by layer. The company claims that this process has significant advantages and benefits over the current traditional metal printing process. Since the technology uses Kinetic energy to fuse the particles, the structure is not subjected to any heat stress as in case of existing powder-bed fusion technologies. This ultimately results in stronger parts. Additionally, it is also able to fuse dissimilar metals together not possible in PBF technologies. The gigantic metal 3D printer is capable of printing parts up to 9 meters long, three meters wide and 1.5 meters high. The complete machine dimensions are 40m x 20m. The best part is that printers using this technology can be even bigger provided appropriate configuration is applied to the printer’s settings. The printer has a versatile printing capability. It can print everything from medical implants to bicycle frames and from luxury luggage to larger automotive, aerospace and defence equipment.